Along the same lines as the AC vs IM tradition is how we take Paul’s instructions to the Christians at Corinth to set aside money, likely at home, so that it can be gathered together on short notice and sent to Jerusalem (and not a command, he says in II Cor 8:8) and turn it into a command that all Christians must contribute to their local congregation every Sunday so that the money can pay the preacher, maintain the building and do all of the other things the church supports. That’s right. I brought this up in a sermon recently and had people thank me afterward. People aren’t going to stop giving because we bring this up. People will be appreciative to bring up things in the text that could potentially undermine one’s own livelihood as a minister. We have to build trust and that won’t come from hiding things. Matt, I’m disappointed you chose not to post my responses. Not wuite sure why, but maybe because i keep bringing up the really BIG white eleohant of our @tradition” of paid ministers. I don’t know what you mean. I don’t block comments. Help me understand what happened. You seem like a earnest, idealistic young man with a sweet family. Has anyone ever told you you’re in the wrong church? Tell me more about what you mean. Idealistic isn’t known to be a complement. So I am not sure how to take it as one. That colors the rest of what you had to say, it is hard for it not to. So let’s clear the air. So what makes me in the wrong church? Are you saying I have to think someone is going to hell to be in the CofC? Are you saying I have to believe in lock step with tradition to be in the CofC? Are you saying that you agree with what I am saying and I need to move on? I would love more explanation because your words are ambiguous and can’t really be interpreted with any level of precision because it could go so many directions and I don’t want to misunderstand you on this. Likely the craziest aspect of the IM issue was that of going to hell for not thinking that the user of IM would go to hell. This meant that my opinion, not any action, was enough to get me a one way ticket. I shook my head at it in disbelief. 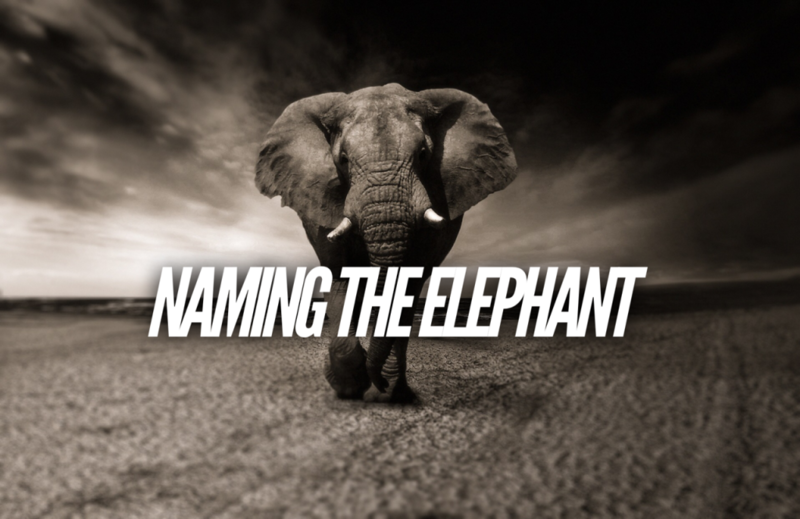 Another elephant is Paul at the expense of Jesus and the gospels. Paul was the cofC hero as he gave the law that helped get the church right. He was the one who answered the questions and whose answers could be parsed down to individual sentences and used against the Baptists, Roman Catholics, and even the cofC down the road. It is amazing that one would think God would send you to hell just because you believed IM was okay, without even practicing it. Goodness! One of the challenges I see with overcoming our codependency is our marriage to the slippery slope fallacy. Although it is known as a logical fallacy, many use it as a law of logic. Because of this, it’s not just that we can’t carry out certain doctrinal views – we can’t discuss them, or even *think* them. If you think differently on the doctrine (especially if you’re in leadership), you’re a threat to the church, since that necessarily leads to waves of change. And discussing it fairly only tempts people to start thinking about it. Thus, in the rare instance that we actually discuss differing views, we strawman them in order to protect our sacred cows. As you pointed out in your last post, this has everything to do with discipleship. You can’t disciple people when they’re terrified to ask honest questions. You certainly can’t encourage anyone to step up to leadership in that environment. Perhaps the first step in moving forward, then, is to separate the carrying out of a doctrinal view and the honest discussion of it. Taking an example from this post, we don’t have to start using instruments just because we honestly discuss it. But we ought to be able to honestly discuss it, and that should include the leadership. I’ve seen too many young people walk away from the church because they see this tendency to intellectual dishonesty. Not only is it preventing discipleship, it’s driving the weak out of the church and driving the faithful to complacency. Yes yes yes! Codependency keeps people in a system from having an open conversation. We can discuss things without pushing for change. We can call something tradition and still believe it is important. Thank you! Not being allowed to change was explained to me by a hard liner in the following way. If you change any thinking and you converted someone based on that thinking, then that person might leave. What he admitted was that people weren’t converted to Jesus but to no IM, proper organization, no repetitive prayer, etc. If you think differently on anything, you’re a threat to the church and won’t be allowed into leadership. Hence why cofC leadership is seen as self-perpetuating and new leaders still only represent one of the many factions. Loved this article. I was actually forced out of a mainstream CoC because I visited a Christian church for a few weeks. I had cleared it with the elders first (I was a deacon at the time). The local Christian church was having a series of lessons I wanted to hear, so I went to their early service (they had two). This allowed me to go there, then come back to the CoC in time for their worship service, so I never missed one of “our” services. Unfortunately, a busybody found out about it and complained to the elders. Instead of talking to me or remembering that I had told them I was going to do this, one of the elders called to tell me I was being removed from any public roles (teaching, song leading, fill-in preaching, etc.) because they didn’t know where my loyalty was, and it set a bad example for the congregation for someone in “leadership” to attend a non-CoC. Um, their actions were the lack of leadership! To Mark’s point above, I also attended a CoC that taught that it wasn’t enough to just stop doing an “unauthorized” act, you had to stop believing it was OK, too. This was at an “anti” CoC as we were meeting with the “liberals” (aka mainstream) to find ways to reconcile. Of course, the anti leaders idea of reconciliation was for the liberals to stop doing everything the antis opposed. The mainstream CoC preacher offered to stop having fellowship meals in their building and sending support to a widows home. That was the only real difference between the two. The anti leaders said that wasn’t enough, that they also had to condemn those practices as sinful from the pulpit and their official doctrines. The mainstream CoC declined to do this, of course, and both sides parted with the anti group having even more animosity and self righteousness. It’s sad, really. Thank-you brother for your honesty and your courage to speak it.